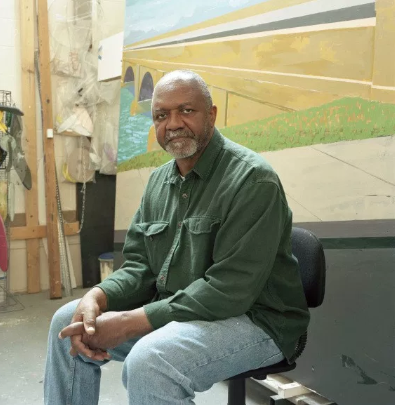 Donna Dennis, NA, an internationally exhibited artist known for her architectural installations, created “Ship and Dock/Nights and Days or The Gazer” in 2018. With its two perched houses and a sky that changes from dawn to star-filled night, it is about time, the transformation of energy, the final journey and our collective journey into the unknown. “Have you ever wanted to walk inside a painting, sit down and experience the work from the inside?...This mixed media assemblage…takes up an entire room and carries psychological power…This is a durational work because beyond the dock the projection of sky above the horizon changes gradually from day to night to day, from painterly sky blues to dark night with brush-stroked stars as a ship changes from white against the night sky to black against the daytime skies in the distance. Thus the elements of engineering and technology that exist here in a three-dimensional space, also includes the fourth dimension of time. And, though that horizon changes, it’s always night for the viewer with the stars shining behind us.” from “Passage” by Annabel Lee, art critical, June, 2018. STUDIO JOSEPH, Founded by Wendy Evans Joseph, NA, Wins 3 AIA New York State Awards! This highly efficient 8,500 square-foot building is an adaptive reuse of historic infrastructure at the center of Penn’s historic campus. With emphasis on transparency and light, the design assembles places for students to gather, collaborate and interact with faculty. 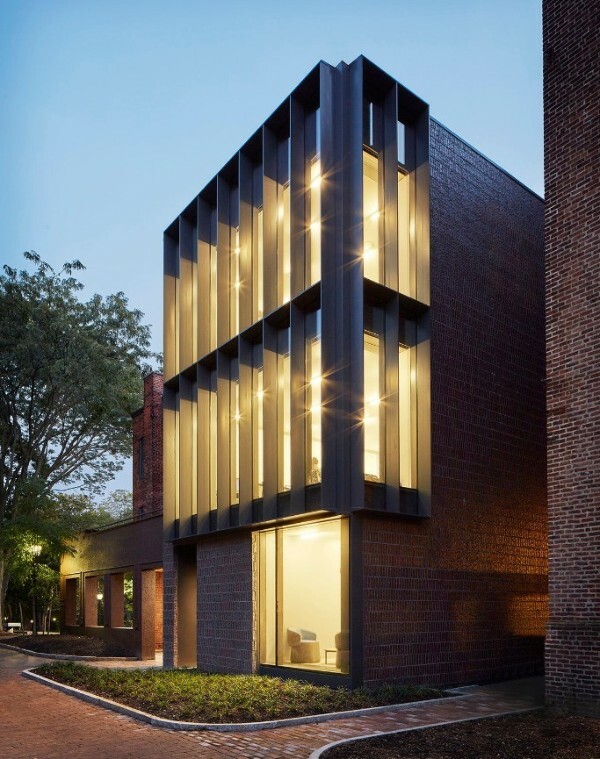 An elegant new glass and steel north facade provides natural light to public spaces and a seminar room. LEED Gold certification is the result of our emphasis on sustainability in all aspects of the design. This permanent exhibition installed throughout the entire entry floor is the first-ever comprehensive telling of New York City’s history. The design integrates graphics, media and a wide range of interactive technology to create an immersive experience for all visitors. As President Woodrow Wilson’s policies of discrimination have come under stronger examination, Princeton sought to capture the complexity of his legacy through the design of an intervention in their central campus at Skudder Plaza. This submission to an invited competition proposes an incremental approach that integrates the voices of those unheard. Pritzker Prize-winner Shigeru Ban, NA has joined the disaster relief effort in Okayama Prefecture, Japan, personally setting up his Paper Partition System for evacuees. The Japanese architect joined the team from the Voluntary Architects' Network (VAN) to construct a set of paper and fabric dividers inside school gymnasiums where survivors of the torrential rain are taking refuge. Together with volunteers, Ban erected a modular system of partitions using recycled paper tubes, cardboard panels and fabric to create areas that can be curtained off for privacy. The materials can all be recycled again once they are no longer required. "It is our mission as professional architects to make living environments better," Ban, who founded non-profit VAN, told local paper The Asahi Shimbun. "We are just doing our job." Schools across the Mabicho district have been turned into a refuge for evacuees affected by the torrential rain that swept western Japan. Up to 30 per cent of the district was submerged under the floodwater, which claimed at least 50 lives. Over 155 people died across the region, making this the deadliest floods the country has experienced in 30 years. 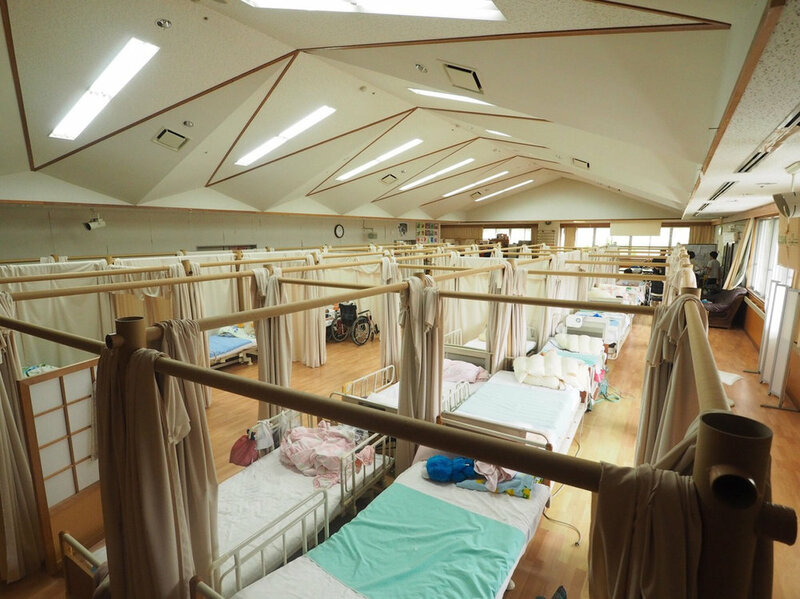 VAN also installed the Paper Partition System to temporarily house nursing home residents whose centre was flooded, adapting each unit to fit wheelchairs and elderly care beds. In 2016 Ban travelled to Ecuador to assist the rebuilding effort following a deadly earthquake, offering architectural training in the affected area. The year before he designed modular shelters for those made homeless in the wake of two devastating earthquakes in Nepal using wood, rubble and straw. He was awarded the Pritzker Prize, one of architecture's highest honours, in 2014 in recognition of his work using low cost materials for disaster relief architecture. After an earthquake destroyed a cathedral in Christchurch Ban built a temporary place of worship from cardboard and panels of stained glass in 2013. Seven years ago in Japan he created temporary homes in shipping containers for those displaced by an earthquake and tsunami. Images courtesy of Voluntary Architects' Network. Today a ribbon-cutting ceremony marked the formal opening of Phase II of Hunter's Point South Waterfront Park. A place of discovery, resilience, and extraordinary drama with its Manhattan skyline backdrop, Hunter's Point presents a new model for waterfront parks. Phase II completes the vision established in the first phase of the park, which opened in 2013. The park's extension introduces an acre of wetlands that recall the site’s pre-industrial history, and features meandering pedestrian pathways that bring the community to the waterfront. The walkways unfurl into a promenade leading to a 30-foot-high cantilevered Overlook, which offers unrivaled views of the East River and shelters the paths and wetland waterfront below. The park incorporates spaces for active and passive recreation, leveraging the site’s industrial heritage to create a new resilient waterfront destination. A new island, kayak launch, promontory green, exercise terraces, and shoreline walkways extend the community’s experience of the East River. New shoreline plantings and wetlands enhance water quality and promote wildlife and fish habitation, while protecting the community from shoreline bank erosion and rising sea levels. The design of the park and open space is a collaboration between SWA/Balsley and WEISS/MANFREDI, with Arup as the prime consultant and infrastructure designer. The project was recently featured in The New York Times. For more information, visit WEISS/MANFREDI's website. Joan Jonas, NA and a friend.